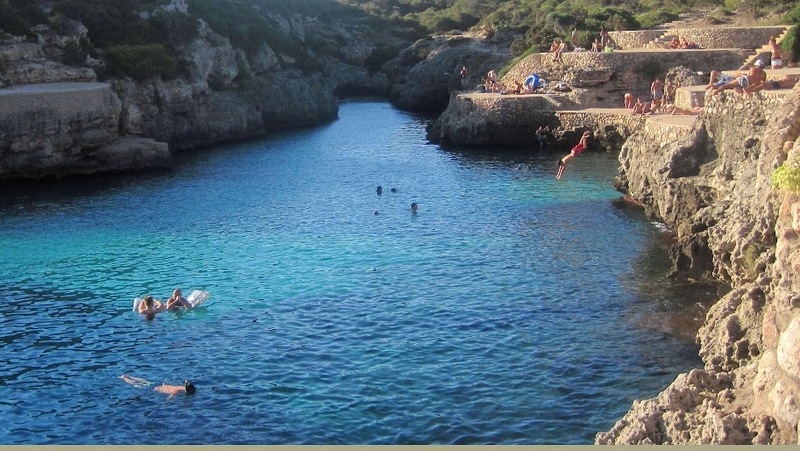 The apartament is located in Cala’n Blanes, a nice quiet area on the west coast of Menorca. The apartment is only 2 km away from the city of Ciutadella with its beautiful harbour, the cathedral, historic old buildings and plenty of shops/market. In the area of Cala’n Blanes there are coves and beaches, these can all be reached within a short walk from the apartment. The nearest beach is Cala’n Blanes, only 100 metres away from the apartment. It is a long pretty cove, with a small sandy beach and calm clear water, here you will find a beach bar. Easily accessible on foot, therefore making it a great place for a drink and relax. Cala’n Brut, a stunning deep turquoise blue cove, surrounded by sunbathing rock platforms on both sides and ladders enabling you to have access to the vast natural swimming pool. Cala de Sa Farola, a small picturesque calm inlet with almost no sandy beach and surrounding rock platforms for sunbathing. Cala´n Forcat, a small forked cove, characterized by its unique shape and setting of rocky cliffs, sunbathing platforms connected by small beautiful bridges.There are two very small sandy beaches at the end of either inlet.